In the 1930s, the Count of Vizela wanted to make changes to his 18-hectare property in the city of Porto and so he called upon to the most prestigious names of the Portuguese arts. The house was built at the highest point of the estate by the architect, Marques da Silva, and is surrounded by gardens to the south and west. The gardens were restored and redesigned by the French landscape architect, Jacques Gréber, (1882-1962), who remodelled the layout of the gardens in a geometric form. The south garden is built around an axis about 500 metres long, along which there are terraces on different levels and water features. In the garden to the west, the avenue of American sweetgums (Liquidambar styraciflua L.) is a highlight. In 1968, this estate was acquired by the Portuguese State. It has been owned by the Serralves Foundation since 1989 and both the museum and the garden are open to the public. The University of Porto Botanical Garden is an eclectic, ordered and designed space of great ecological, aesthetic and referential interest. It is rich in plants, stories and memories, where the remodelling performed during the end of the 19th century and the second half of the 20th century are highlights. It is located on the western side of the city of Porto, near the Arrábida escarpment, on the remaining area of the former Quinta do Campo Alegre, now only 40,000 m2 (4 ha). 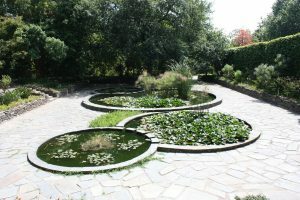 The proximity of the Atlantic Ocean and a granite substrate provide the conditions for a varied, robust and many-layered plant community which includes plants from the most diverse bioclimatic regions of the world, with the collections of camellias, conifers and succulents being the highlights. It is spread over three levels in a mosaic of spaces, habitats and species, full of surprise and diversity. The first terrace, at the greatest height, houses the main building, the groves and the formal gardens, compartmentalised by hedges carved from ancient Camellia japonica. On the second level, you will find the cactus garden and the greenhouses. The third level, the lowest, contains the arboretum, the fern garden and the large lake. It is now an integral part of the Museum of Natural History and Science of the University of Porto, a historical, scientific and artistic garden. 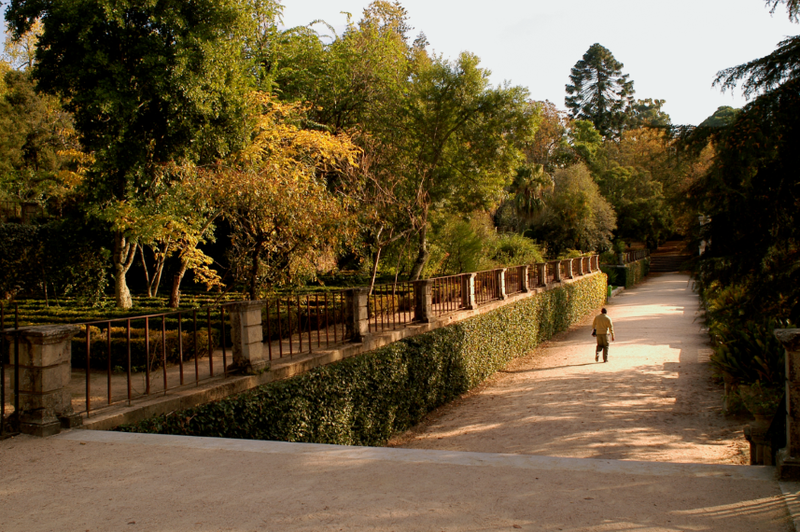 Two of Portugal’s most important writers, Sophia de Mello Breyner Andresen and Ruben Andresen Leitão are associated with the gardens. The Italian architect Nasoni built one of the most original baroque style houses in Europe in Mateus, incorporating highly creative details. The gardens descend from the house in hedged terraces, drawn in a complex series of flowerbeds. A tunnel of cypresses surprises us: one walks through a magnificent vaulted passage formed by the fresh foliage. At the end of the walk, the most beautiful topiary design awaits the visitor, whose lines radiate from a Hinoki cypress [Chamaecyparis obtuse (Siebold & Zucc.) Endl.] in a series of scrolls, arches and arabesques. The oldest traces of the gardens date back to the end of the 18th century, and during the 19th and 20th centuries the gardens underwent new reformulations and the introduction of exotic species. D. Francisco de Sousa Botelho de Albuquerque commissioned the landscape architect Gonçalo Ribeiro Telles to make the project of the landscape in the 50s and 60s of the last century, and thus totally changed the whole area that frames the main façade of the House. He created a new entrance framed by a lake, a water mirror built in the 50s which perfectly prolongs the building set: its reflection reproduces the image of the main façade, and it is surrounded by a forest of chestnut trees and oaks planted in the 60s. When the reflection of the House is seen, it seems to be in the middle of the vegetation. Alto Douro Vinhateiro is a particularly representative area of the landscape that characterizes the vast Douro Demarcated Region, the oldest regulated wine-growing region in the world. 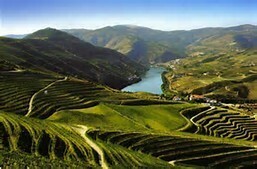 The cultural landscape of the Alto Douro combines the monumental nature of the valley of the Douro River, made of steep slopes and poor, rugged soils. The ancestral and continuous action of Man is added to this, adapting the space to the Mediterranean-type agricultural needs that the region supports. This intimate relationship between human activity and nature allowed for the creation of an ecosystem of unique value. The features of the terrain are exploited in an exemplary way, modelling a terraced landscape, which preserves it from erosion and enables vines to be cultivated. The region produces the famous Port wine, which represents the main vector for promoting local technology, culture, tradition and economy. The great human investment in this landscape of singular beauty enabled its settlement from the times of the ancient Roman occupation, and it has resulted in a living and evolving reality. At the same time, as being a witness to the past and the motor of the future, it is firmly anchored in the optimization of natural resources and in the preservation of the environment. Quinta do Bomfim is one of the most emblematic ‘Estates’ of the “Cima Corgo” region, located in Pinhão, in the valley of the stunning Douro River. One of the most emblematic of Dow’s wines has been from this Quinta since 1896, when it was bought by the company, which now belongs to the Symington family. Amongst them are, for example, the recent Dow’s 2007 which earned 100 points, or the 2011 which was elected the best wine in the Top 100 of WineSpectator in 2014. Symington, in fine British style, has the greatest respect for its roots, its history and its heritage. That heritage is definitely linked to wine, particularly to Port wine, which they decided to share with the general public, not only via their wines, but also by opening the doors of their Quinta to the public. 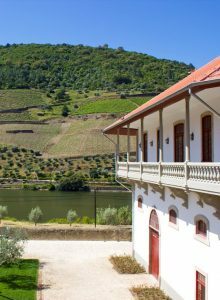 Similarly, to what they had already done with Graham’s Cellars in Vila Nova de Gaia, the Symingtons bought and renovated all of the Bomfim property, readied it for wine tourism, and made it distinct from other Quintas in the region. the access road to the house, flanked by an imposing sculpted hedge and the garden of the main house, with its water elements and hedged flowerbeds punctuated by seasonal flowers, varied in colour and perfume throughout the year. The gardens recently built by the owners have endowed the Quinta with new spaces for recreation and leisure, and have contributed to the dynamism of the Casa de Juste as a centre of tourist attraction in the region. 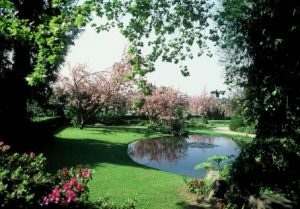 The spaces have great variety such as the Lake Garden, the English Garden of the or the Perfume Garden, the avenue of peonies, or the collection of camellias. The history of the convent takes us back to the 11th century and its peak was as the base of the Benedictine order during the post-Philippine period (1640). A strong Brazilian connection can be seen in the works of the grounds, where nature is marked by a clear geometry and an elaborate decoration, both characteristics of the baroque style. The agricultural lands reach almost to the south façade of the building that rests at the bottom of the slope. Shaped into terraces, they guaranteed the production for the convent. 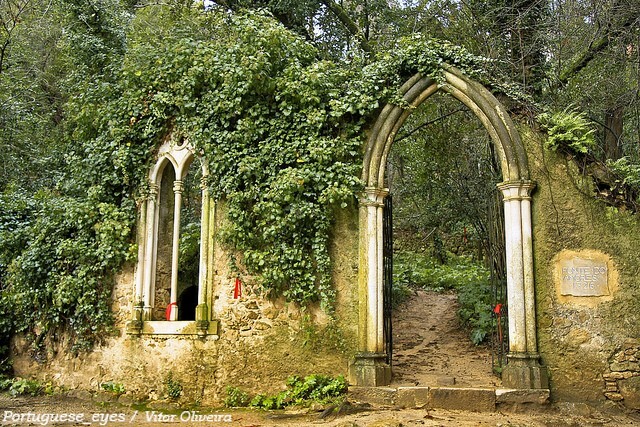 When the Portuguese State bought the Monastery of Tibães in 1986, the forty hectares of the grounds were in a state of desolate abandonment. An exemplary restoration coordinated by landscape architects followed, which was recognised with the Carlo Scarpa award by the Benetton Foundation (Italy). Further works in recent years have guaranteed and preserved both the everyday and the erudite, esteeming the monument and thus guaranteeing its authenticity. The garden of the Casa do Campo is a clear example of the development of the art of topiary, which was emerged in Portugal from the 1600s. This form of sculpture had camellias as its main support and rapidly progressed as art after the introduction of the species in the north of Portugal in the late 16th century. The gigantic scale of the garden’s topiary figures rivals the very architecture of the house, making it a striking composition, unparalleled in Portugal. At the entrance of Casa de Campo one is surprised by two monumental cylinders carved in camellias. The art of topiary, which became popular from the 16th century onwards in the north of the country, has Camelia japonica as its main support here. Three summer houses are carved out of the vegetation, creating an astonishing and intimate composition. 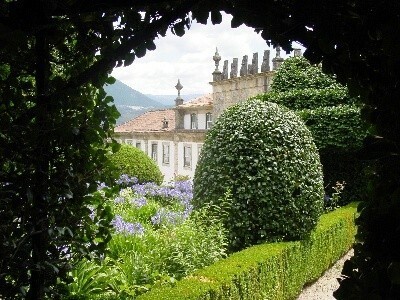 Quinta da Aveleda belongs to the Demarcated Vinho Verde Region. The vineyards surround the landscape composition by Ju Janson: a garden-forest of an immense botanical variety, criss-crossed by straight avenues and winding paths. On the pathways between lakes and pavilions, one is struck by the follies, a testimony to the artistic reverie in vogue in the Romantic period. This garden is also a masterpiece of maintenance, since it has been unchanged since its inception and subsequent expansion in the 60s of the last century, thanks to a dedicated model of maintenance. The garden is startling for many reasons: the exotic flora, the peculiar architectural complex, and the careful details that enrich the paths, and the history of the Guedes family, which has been the owner of the world-famous brand of vinho verde for several centuries. 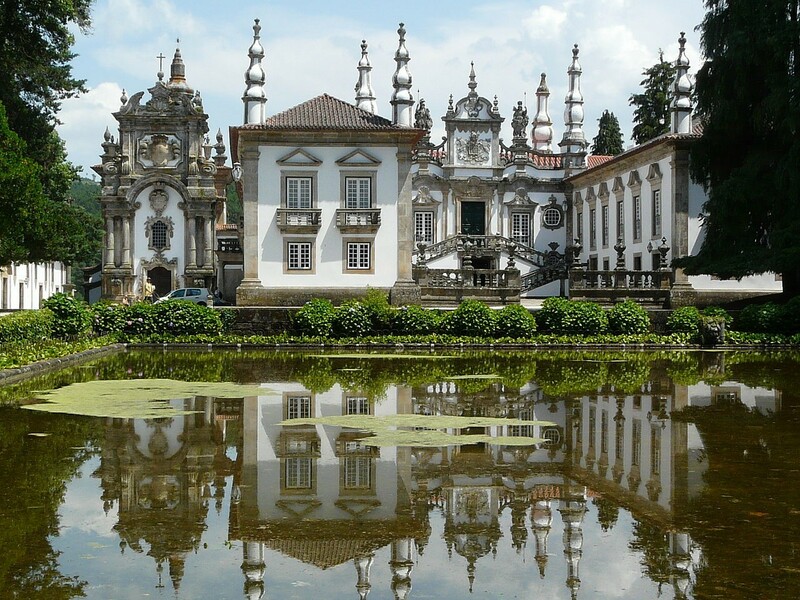 In 1671, the first building took place in Quinta da Aveleda, namely the chapel, annexed to the main house. It was also in the 17th century that the Guedes became masters of the property. But it was in the 19th century with Manoel Pedro Guedes – former deputy, a visionary romantic, voluntarily exiled in Penafiel – that the space gained considerable dimensions. In the garden, following the path of azaleas, you reach the Fountain of Our Lady of Vandoma, the patron saint of Porto, surrounded by flowers of all varieties. In a nearby corner, the turtledove cage, in an approximation of Indian style, dates back to the time of the Countess of Pangim, married to Manoel Guedes and daughter of the Viceroy of India. The manor house from the end of the 19th century is covered with vines and exotic plants and is another romantic landmark of the property. The University of Coimbra Botanical Gardens are located in the historical centre of the city, on one of the slopes of the right bank of the river Mondego, and were classified as a Property of Public Interest in 1996. The Gardens are structured into two zones: the formal garden occupying 3 hectares designed in terraces, and the 10-hectare forest. 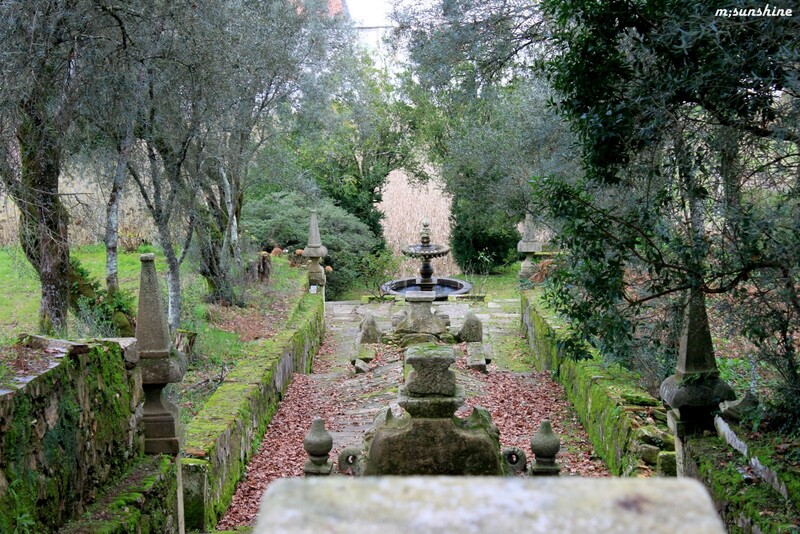 This garden dates back to the 18th century, during the Pombaline reform of the University of Coimbra. The work began in 1774 and lasted for more than 20 years. The beginning of the work was under the direction of Domingos Vandelli (1735-1816), who presented a proposal for a layout very similar to the Garden of Padua. However, only one part of his project was built, the terrace that was called “the square”, on the slope of the grounds of the Benedictine convent. Later in 1791 the garden was enlarged with the acquisition of a piece of land belonging to the Marian Fathers (1809), under the direction of Avelar Brotero (1744-1828). He was an illustrious Portuguese naturalist who studied medicine in Paris, was a pioneer of the studies of Taxonomic Botany in Portugal and wrote the first Portuguese flora. When he assumed his position as Director, Brotero dedicated himself to the improvement and enlargement of the garden. The model followed for the construction of the garden was inspired by that of his colleague Lamark (1744–1829), responsible for the Jardin des Plantes, and it was skilfully adapted to the terrain of Coimbra. Júlio Henriques (1838-1928) was appointed director in 1873. He was a great promoter of the introduction of botanical studies in Portugal, founded the Broterian Society and developed and consolidated the Herbarium of the University of Coimbra and the Coimbra Botanical Gardens. Later, the botanist Luís Wittnich Carrisso (1886-1937) took over these gardens from the year when he became a full professor, 1918, to his death in 1937 and he greatly enriched them with new plants, particularly exotic African plants, the majority from Angola. The 20th century was marked by a botanical enrichment with plants brought from African colonies and botanical explorations in Portugal. The importance that the Coimbra Botanical Gardens occupy in the field of botany and education and research in ecology, as well as their historical and landscape value, make these gardens unique both in the city of Coimbra and on a national level. The 12 hectares of botanical gardens of Quinta das Lágrimas are a true Museum of Vegetation, where specimens of trees from the five continents can be found. Some of the species housed here are even unique in Portugal. The collection of Lágrimas includes trees as varied as Australian fig trees, camphor trees, maple trees, sequoia trees and palm trees, amongst hundreds of others. 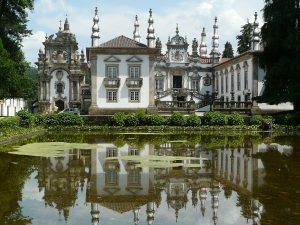 Quinta das Lágrimas is known by many as the site of the tragic love story of King Pedro I and Inês (made queen after her death by D. Pedro). Its gardens include a medieval garden, a 17th-century forest and a romantic garden with streams and cascades befitting its style and plantations of exotic species of various sizes. 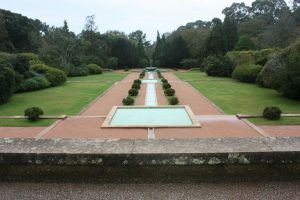 An important restoration project by the landscape architect Cristina Castel-Branco was completed in 2009, adding new functionalities with the construction of the contemporary garden. ANDRESEN, Teresa; MARQUES, Teresa − Jardins Históricos do Porto. Lisboa: Edições INAPA, 2001. ARAÚJO, Ilídio Alves de − Arte Paisagista e Arte dos Jardins em Portugal. Lisboa: Direcção Geral dos Serviços de Urbanização, 1962. CASTEL-BRANCO, Cristina (dir.) 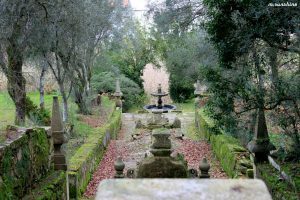 − Jardins com História: Poesia atrás de muros. Lisboa: Edições INAPA, 2002. CASTEL-BRANCO, Cristina − Jardins de Portugal. Lisboa: CTT – Correios de Portugal, 2014. 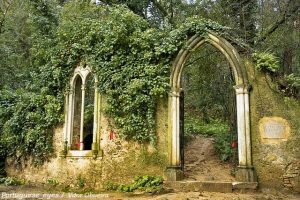 MARQUES, Paulo – Disponibilizou o texto sobre o Jardim Botânico do Porto, 2017.